After the trip to Assisi, we had our first day of classes and a more regularized schedule today. The first classes of the morning were on Church history with Fr. Heisler and were his typical classes — a lot of information! In the afternoon, we had a class with Fr. Cassian, OSB, the prior of the monastery here in Norcia. He spoke on Liturgy and primarily focused on the Holy Father’s views on liturgy, which were quite enlightening. Fr. 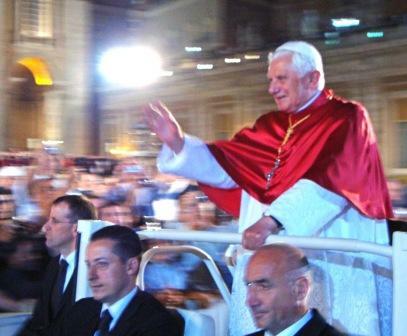 Cassian explained there was much reform to be done, but Pope Benedict isn’t seeking to change things overnight; rather, he has a deep desire to allow the Church to reform herself, and, over the next generation, allow the people to grow into a deeper reverence and a newness within the organic growth of the Liturgy. Tomorrow , he’ll speak on how exactly that is to look over the next few decades and what would be logical within the proper growth of the Church – this I am eagerly looking forward to! By their example, my parents showed my four siblings and me how important their faith was to them. My family gave me a wonderful experience growing up, really demonstrating the importance of love and family. As I reflect on the reality of God and the importance of faith, I think especially of my father, who converted to the Catholic faith when I was seven years old. My own faith grew during my brother’s treatment for a brain tumor. Through his life and short struggle, I turned deeply to prayer and dependence on God. I believe this made me open to the possibility of a vocation and enabled me to hear and to respond. The only time I was asked if I had a vocation was by my parish priest after my brother died. I was actually thinking about it, but was not yet ready to admit I might have a vocation. The Lord was patient with me and gave me the time I needed. I attended public schools my entire life. At the University of Wisconsin at Milwaukee, I was very involved in the Newman Center, which was also a good place to meet and make friends. I went to college with only the intention of going to Sunday Mass, because of how important my faith was to me, but nothing more. I tried to do something special for Lent that first year of college, though, so I went to Mass twice a week; I did, and got the feeling that I had to become a priest. This feeling of being drawn towards the priesthood was unexpected and unusual for me, since I intended to graduate with a major in accounting and finance. 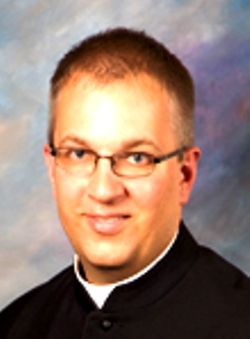 The priest at the Newman Center, Father Mark Niehaus, helped me to discern what God was doing in me, and gave me the courage to say “yes” to God, give the priesthood a chance, and enter seminary. He helped me reach the point at which I said, “God told me all is going to be about what he wants; now it is time for me to respond and give him an answer.” And that is what I did. I want to be a part of The Rome Experience to gain a deeper appreciation of the richness and universality of our Catholic faith. I am one of nine children born to John and Virginia Drew. I have six sisters and two brothers; four older and four younger. My mom and dad were very devout Catholics, as were their parents. We went to Mass faithfully and said the family Rosary most nights. I think fondly of my dad sitting at the head of a huge oak table at Christmas time, reading from Luke, then reading ” The Night Before Christmas” with one of my younger siblings or a nephew or niece on his lap. How blessed I was to be a part of this big, loving Catholic family. My dad died of cancer at age 62, at home, surrounded by his family. His death really brought us closer together. Afterward, my mother began to attend daily Mass and became a Third Order Carmelite, and our conversations became more focused on Catholicism and all that goes with it. My mom’s mom kept house for a monsignor for 29 years, starting shortly after my grandfather’s death. Two of her sons, my uncles, are diocesan priests, so I suppose clerical life is in my blood. I seemed always to be attracted to the sanctuary and was called to serve at the altar at St. Peter’s grade school for special occasions. 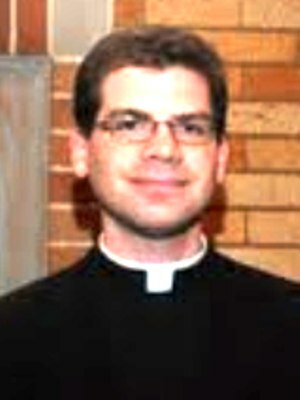 I suppose many people through the years told me I would be a good priest, or asked me if I considered the priesthood. But I was determined that married life was for me, despite the fact that God was calling me. I ignored it for as long as I could; I would fight it, just saying “no”. An older priest, whom I met in 2001 and who is still my pastor at age 88, had a tremendous influence on me, as has my courageous bishop, Robert Finn, who came to Kansas City in 2005; in them I have seen firsthand what it means to be a true shepherd of souls. One of my uncles, a priest for 60 years, has been to Rome many times, twice with his sister, my mother. Both have said repeatedly they could not wait for me to go there, too. I look forward to studying in the Eternal City and sharing my experiences with these people who have meant so much to my vocation. I grew up in a small house with a big yard, plenty of food, a few problems and a lot of love. I was immersed in Catholicism through school, Scouts, fish fries and Mass. Mom was a cradle Catholic, the keystone of prayer and faith in the family. Dad was a Protestant who took a wavy road to conversion; by 1977 he converted to the Catholic Church in large part due to Mom and the Blessed Mother. He was, quite simply, in love with both of them. Through my parents’ model of love, it was easy for me to love Jesus. Growing up, I was always interested in the priestly vocation, but I desired a relationship with God only as long as it was in the confines of attaining worldly riches. Once I decided to pursue God’s calling, the riches of life were no longer at the forefront: my desire for God was! 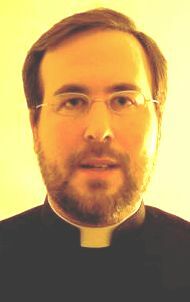 During this conversion experience, many people asked me if I had a vocation. One day, God will ask me “What did you do to stop abortion?” and I want to respond with, “I was praying at the abortion clinic, marching for life and counseling mothers”. I want to be part of The Rome Experience to develop my baptismal relationship with God to enable my priesthood to flourish. What better place to do this than Rome? I grew up on a family farm in rural Tippecanoe County; my family worked together, played together, ate together and prayed together. We raise corn, soybeans and beef cattle. My parents dated in high school. My father was raised Catholic; my mother decided to convert from Protestantism before she married him. They had four children. In 1994, when I was seven, my brother Jacob passed away in a car accident that also injured both my parents. It was a tragic loss, but today our family couldn’t be any stronger. In high school, I was co-captain of the football, basketball and math teams, secretary of National Honor Society, and vice president of 4-H club. I worked with Habitat for Humanity and taped Mass for the sick and elderly of the parish. I dated a girl for nearly three years, which was a valuable life experience, but I ended the relationship in senior year after realizing our life interests had diverged. I dated only a few times as a college freshman, and have not dated since. My first work experience was helping my father farm; I baled straw and hay, plowed fields and drove fence posts. My first paid job was working with my brother Paul, raising sweet corn on three acres of land my grandfather gave us. We picked the ears at harvest and sold them at a roadside stand; this was how we began saving for college at an early age. I have also worked as a busboy and waiter, as a football coach, and as a trigonometry and algebra tutor. I interned in sales and marketing with the John Deere company, but though I was offered full-time work there, I decided corporate life was not for me. I went to Purdue University as an agricultural economics major and an invited walk-on for the football team. Football filled my freshman year, but I soon realized football wasn’t the greatest joy in my life. I made Dean’s List and learned much, but had already begun considering a vocation. The diocesan paper carried a section in which many local priests shared their discernment stories. I was shocked at how normal their stories were, and how eerily similar to mine. Thoughts of the priesthood increased as my prayer life grew stronger in college. In my sophomore year, my parish priest told me that, while he prayed at the Grotto during a visit to Notre Dame university, he continually thought of me, and concluded that maybe God wanted me to transfer there. A week later my cousin, a recent Notre Dame graduate, told me he thought I would be interested in an undergraduate seminary at Notre Dame. I soon made a visit and decided it was God’s will that I be there. Old College, the undergraduate seminary, was a wonderful experience. I studied philosophy and economics, helped run Eucharistic Adoration, played basketball and joined the boxing team. After three semesters, I became sure of my call. I graduated from Notre Dame, and knowing that I had succeeded at a very prestigious and challenging university was something I could be satisfied with for a long time. I have a deep devotion to our Blessed Mother, and ask her for help in times of temptation and when I am scared, tired or worried. I look forward with excitement to the next stage in life, confident that I am being obedient to God’s call. I grew up in a non-Catholic home. However, my parents are very faithful Christians, and their example and witness in faith were very important to me during my childhood. I look especially to the kind and generous, yet firm, leadership over the family shown by my father, who remains a profound example to me of the love of our eternal Father, and of the kind of spiritual father I would like to be as a priest. My brother, eight years older than I, is a wonderful example of a Catholic professional family man; our relationship has been particularly close since we were each received into the Church, by very different paths, but providentially on the same day in 2003. Having grown up without fully experiencing the Mass, I was drawn with deep longing and love to the true encounter with Jesus Christ in the Eucharist, and wanted that as part of my life. During the time of my conversion and in my first years as a Catholic, I studied to become a church musician. Before I entered seminary, I worked as an organist and choir director in several excellent parish music programs, but remained restless in that life, more and more convinced that my vocation was, in fact, to the priesthood. Although it is no longer my principal professional occupation, music remains an important part of my life, and I appreciate the opportunity to continue to use my musical training. 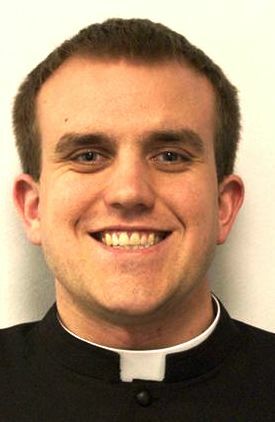 Seminarian and priest friends, along with my spiritual director, told me they thought I would make a good priest, and encouraged me in the initial stages of discernment. I was also inspired by the example of numerous holy priests to esteem and respect their life of self-sacrificial joy. Most of all, the constant tugging at my heart towards a complete service to God grew stronger, until I knew I had to consider the priesthood. As a convert, I have a particular appreciation for the universality and unity of the Church. Based on reports from friends who took part in The Rome Experience last year, I am certain the program will offer spiritual and intellectual nourishment as I prepare for the priesthood. Born in Massachusetts, I have an older brother and a younger sister. My parents were always supportive of both the Church and priests. My father, especially, mirrored for me in his life a desire for hard work and a great capacity for forgiveness and empathy in his dealings with others. Like the father in the parable of the Prodigal Son, he challenged me on my own notions of forgiveness and mercy, much to my frustration at times. But this caused me to reflect on my own relationship with God the Father, and challenged me to examine my life and vocation – a call I initially heard at around age six. My great uncle was a priest who encouraged me from a young age to consider the priesthood. His funeral made me realize he had been important in the lives of literally thousands of people. This made a deep impression on me, a high school student . After graduating with honors in psychology and English from the University of Michigan, I started to participate more in the life of my local church, taking part in perpetual adoration, children’s catechesis and RCIA. My pastor encouraged me to go on a silent 30-day Ignatian retreat, a powerful event in my life that solidified my desire to continue discernment for the priesthood. Soon after, I entered the seminary. My parents, particularly my mother, have always been very positive about the idea of a vocation to the priesthood. My mother instilled in me very early a love of the Church, especially of the Eucharist and the devotion of Adoration. I have five siblings. My mother was in charge of Adoration at our parish; she also home-schooled us. Because of this, I was able to make a weekly Holy Hour, frequently alone, and I believe this is when I fell in love with the Eucharist and Adoration. I first felt a call to the priesthood shortly after receiving first Holy Communion. At the time, my father, who is an Army helicopter pilot, was stationed in Germany. Because there were not many Catholics, children were allowed to serve Mass as soon as they had received Communion. 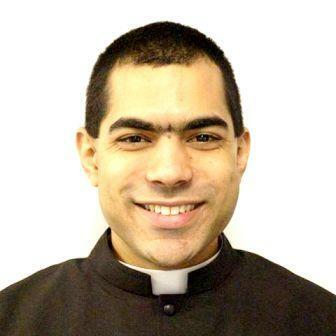 I think, at that time, I was more eager to serve Mass than to receive Communion, but our priest at the time – Father Donald Blickhan – recognized in me a possible vocation, and spoke with me on several occasions about the possibility of becoming a priest. I distinctly remember some of these conversations, walking around the little chapel and even a bit of joking that I “might be the first American pope”. Kidding aside, our talks had a great impact on me, and always reminded me that I needed to consider the priesthood as something to which I might very well be called. I have learned far more from watching others than from any theory or book I have ever heard or read. First and foremost, my mother has been an incredible influence on me; her love extends beyond simple piety, and sees the Church as a family member to be cared for and fiercely protected. Saints who have influenced me include St. Francis de Sales, St. Louis de Montfort and Our Lady; Archbishop Fulton Sheen helped me learn the need for self-sacrifice. During high school, I was very involved in the parish youth group, and try to visit them whenever I can; I have also become involved in Knights of Columbus and the seminary liturgy committee. 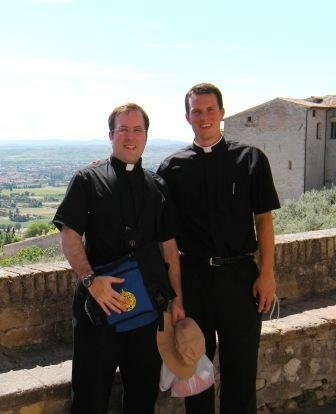 Throughout my life, many people have asked me if I had a vocation to the priesthood. Of these encounters, the most profound occurred when I was about 12 years old. I was swimming with some friends at the home of a woman I had never met. At one point, the woman approached me and asked, “You’re Brendan, right?” I answered that I was, and she asked me “Will you invite me to your first Mass?” I was dumbfounded, and to this day cannot remember what I said in reply, except that I very quickly jumped into the pool after she was done talking! I feel that without the priesthood, my life would be good, but not as good as it could be – and I definitely would not be as happy as I believe I will be as a priest. I am very excited about seeing the Church at her heart in Rome, and especially about taking part in closing ceremonies for the Year of the Priest. I see this as a wonderful opportunity to grow in love of the Church and her Head, Jesus Christ. I had the grace to be brought up Catholic, praying the family Rosary, with a mother who consecrated all her children to Mary after our baptisms. One of my sisters was a FOCUS missionary for a couple of years, and my other sister has just started a religious vocation. Growing up, I was an altar server. In high school, my faith dwindled a little and it was not until college that I started taking my faith seriously after being challenged by Protestants and not being able to state what I believe. My dream was to become a baseball athletic trainer, and I had different jobs involving professional baseball. 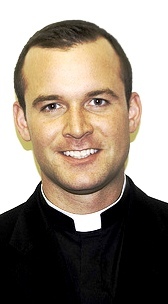 After graduation, I had a powerful experience, during Adoration, that God was calling me to be a priest. 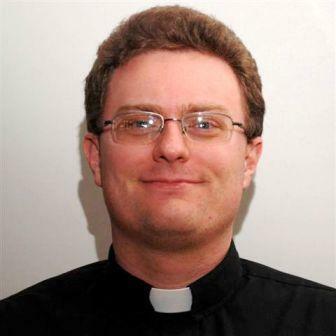 At that time, I didn’t have any idea how a person becomes a priest; no one ever asked me if I had a vocation while I was growing up, although I do remember parish priests making a good impression on me, and remember thinking about the priesthood when I was smaller. I ran from the call, still pursuing my “dream job”. Yet, when I got the job, I was not happy – and God was still calling me, even though I was doing what I had thought would bring me happiness. I quit my job, after being chosen Athletic Trainer of the Year for my league. I entered seminary, and I have found a lasting joy that nothing else in this world could contend with. Here in the seminary, I started a “Militia of the Immaculata village” to promote and foster Marian devotion. This is very important in my life, and I have grown to love St. Maximilian Kolbe’s understanding and promotion of Marian consecration. As part of The Rome Experience, I hope to grow in knowledge of the church beyond my own diocese and to grow deeper in my vocation. In our large Irish Catholic family of eleven children, my parents taught us to have God at the center of our lives, and attended Mass every morning. 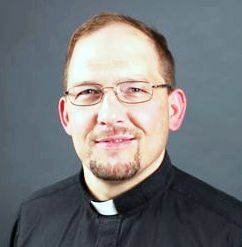 My grade school pastor, Fr. 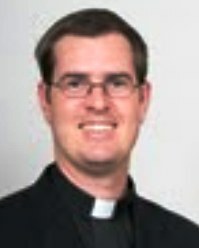 William Grady, inspired me to take a serious look at priesthood. He was always at peace. Even as a child I realized many people were not at peace, and I felt that by emulating him, I too could live a life of peace and help others do the same. Fr. Grady and his associate pastors often told my brothers and me that we would one day make great priests. My brothers Kevin, Dan , Pete and I served Mass almost every day in summers and were great friends. We had a neighbor, Jim Fox, an older man who spent most of his time at church and volunteered at our school; we thought he looked lonely, so we adopted him as our friend and spent most of our days at his house. Jim inspired us to do our best in school and sports. But during my junior year in high school, Jim took his own life. His death forced me to analyze the life I was living, causing me to take the Catholic Church seriously and develop a prayer life. Kevin and Dan, however, got involved with the wrong crowd and struggled a great deal. Both joined the Army, serving in Iraq and Afghanistan. Kevin is now out of the military but suffers from Post Traumatic Stress Disorder as a result of combat. At 30, Kevin had a massive stroke and was partially paralyzed. These experiences, and those in college, fraternity and at the Ball State Newman Center, solidified my vocation, making me aware that I was called to assist others and live an unselfish life. I found that by focusing my attention on God and others, I became energized and filled with peace. I currently attend Mount St. Mary’s seminary, where God has showered me with many blessings. I have served as chaplain to the university baseball team and hope one day to serve on a college campus. I believe The Rome Experience will give me a fuller vision of the universal Church; until now, I have only experienced the local Church, which is a small section of a much larger picture. After graduating from high school, I attended the Massachusetts Institute of Technology, where I earned a degree in computer science and engineering. Though I attended Mass during college, my faith did not blossom until after graduation, when I moved to Minnesota for work. A very active parish and a city-wide Catholic young-adult group there provided fertile soil in which my faith could start to take root. Gradually, my faith grew stronger and stronger. At the same time, however, my career goals became more difficult to define. Although a number of people asked me whether I had considered a vocation, I dismissed their suggestions, as I had no interest in the priesthood at the time. When I moved to Madison, Wisconsin, my faith continued to grow, and I began to realize the value of seeking God’s will for my life, rather than simply following my own inclinations. The examples of Msgr. Kevin Holmes, Father Eric Nielsen, Father Victor Mosele, and Father Eric Sternberg, showed me the dignity and sanctity of the priesthood. In autumn of 2008, I decided to discern the priesthood, not because I was attracted to it, but because I was finally able to trust that I would be happiest following God’s plan for my life. In the first days of 2009, while I was praying before the Blessed Sacrament, God definitively revealed my vocation to the ministerial priesthood. I joyfully accepted the invitation, and am now enjoying my seminary studies. My family responded well to the news. My mother and father are happy for me and offer their steadfast support. My sister and brother, who live together in Chicago, are also supportive. The three of us enjoy getting together in Madison or in Chicago, exploring the cities and trying different ethnic foods. Recently, I have been singing in a choral ensemble at St. Paul’s University Catholic Center in Madison. I love to sing in church, and this has exposed me to the intensely beautiful sacred music of our Catholic tradition. I am excited by the opportunity The Rome Experience offers to learn more about Church history and culture – knowledge I can apply in my service to the Church. 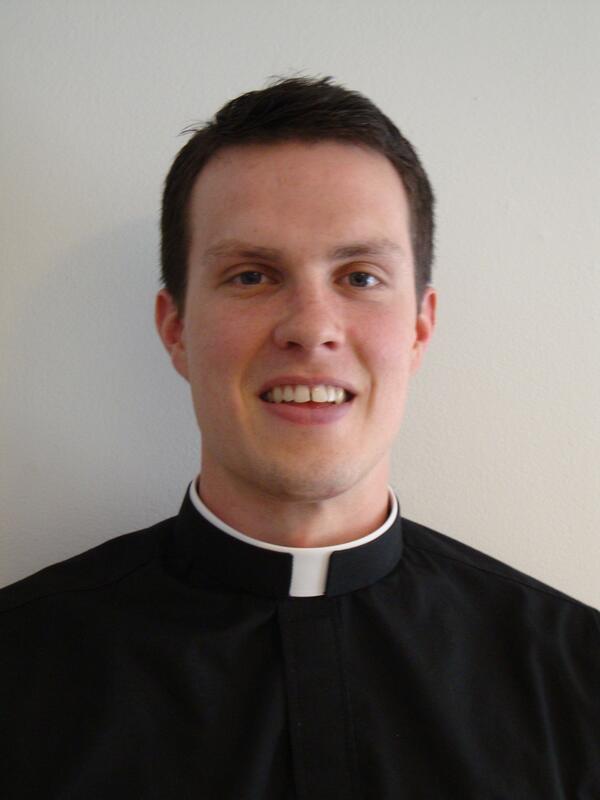 My vocation story started when I was a nine-year-old altar server. I remember how the priest held of the bread and wine, and I remember saying to myself, “I want to do that”. I grew up active in church youth group, catechism, vacation Bible school and so forth because I felt God calling me to serve him in these ministries. In high school, I seriously considered the call to the priesthood, visiting the Detroit seminary and applying for admission in 1998. But though I was accepted, I held back, not ready yet to proceed; instead, I studied history at the University of Michigan. During college, at the height of the Church scandal in 2002, my family and I left the Church. I settled in the Lutheran church, but my parents went to another denomination. Despite this break within the family, they always supported my call to ministry. I always loved the Mass but could not embrace the hierarchy at that time. As a Lutheran, I reconsidered my call, and in 2004 began studying to be a Lutheran minister. I was amazed at how much I learned about the Catholic Church in Lutheran seminary. While I was there, Pope John Paul II passed away, and I felt compelled to attend a Catholic Mass in his honor; after that, I began to move back toward the Catholic Church. During this time, my parents and brother also returned to the Church. That summer, I worked as a chaplain at a Catholic hospital. Though I did not receive the Eucharist, I attended daily Mass there and prayed before the tabernacle, and realized how much I truly missed the treasures of the Church. At the end of the chaplaincy, I faced a difficult question – be ordained a Lutheran minister, or follow my heart and soul? Ultimately, I obeyed my conscience and returned to the Catholic Church. I became very active in my local parish, with an encouraging spiritual director. Before I could enter Catholic seminary, I had to petition the Vatican because I was considered irregular for Holy Orders according to canon law. My petition went to the Congregation for the Doctrine of the Faith; it was granted, for which I am forever grateful. When my bishop asked me if I wanted to be a part of The Rome Experience, I was humbled beyond belief; I believe The Rome Experience will enhance my spirituality and zeal for the Church in ways I cannot yet imagine. As the Psalm says, God has been very kind and merciful to me. I am a convert to the Catholic faith. I was born on Dec. 8th, the Solemnity of the Immaculate Conception, so I know Our Lady’s prayers have been with me since I was young. My family was nominally Protestant, and we went to church once in a while. I was baptized as a baby in the Methodist church. Although my parents were not very religious, they always encouraged me to “be whatever I wanted” when I grew up. My parents loved me the best they could and always stressed the importance of education. When I left for the University of Northern Colorado, I had plans to stay active in church, as I had been very involved in high school youth group. But though I wanted to be near God, I was away from church for the next three years. During my senior year, I lived with my two best friends. Early in the year, both roommates had personal conversion experiences, and I began to go to Bible studies with them my last semester. In the Catholic Bible study, we learned about salvation history and the truths of the Catholic faith. One night I, too, had a very powerful experience of Jesus Christ. My Catholic friend entered seminary the next fall. He pointed me to good Catholic sources and I studied the Faith intensely. Two years later, I entered the Holy Catholic Church at Easter, in Denver, with my friend as my sponsor. This friend of mine has now been a priest for four years. He has been a great example to me of priestly zeal and charity. Through him, I met Archbishop Chaput, whom I saw as a great example of the fatherly heart of a priest. When I was in Los Angeles getting my master’s degree in counseling, I also had a wonderful spiritual director who helped me tremendously with discernment. Only a couple of weeks after I first received the Holy Eucharist, I started having thoughts about the priesthood. Several times a week, I was able to go to Holy Mass and stay for almost an hour praying in front of the Blessed Sacrament. It was there I felt God calling me to consider a priestly vocation. Several people, including two priests, had already encouraged this. I loved teaching Confirmation classes and Bible studies. I moved to Denver and worked in a parish as director of adult education and RCIA. During this time, I knew I wanted to go to seminary, and entered that fall. We are blessed to have a Spirituality Year at our seminary. This is a year of study, prayer, silent retreats — including one lasting 30 days — and working with the poor. Seminary has helped me grow in many ways, even difficult ones, which are often the most fruitful. I have been involved at the same parish for two years; for four years, I helped lead a monthly two-hour time of adoration and confession for 300 young people. I am also part of the Companions of Christ, a group of seminarians committed to living life in community as diocesan priests. I am so grateful for the chance to be part of the Rome Experience. I pray that Our Lord will bless all who make this program possible. Immaculate Heart of Mary, pray for us! I was blessed to grow up in a Catholic family and had wonderful examples of the faith in my parents. I would describe my family as not “super” Catholic, but just people who live and practice their faith. My father always insisted that we find a Catholic church on Sundays no matter where we were or how far we had to travel; my mother is a convert from a Methodist upbringing. I could not have asked for a better life, growing up; it was filled with activities, athletics and constant support in all I aspired to do. We were a small family of four, which I think helped us lean on one another and be more involved in each other’s lives. Our roots are in a small Volga German settlement of immigrant farmers in western Kansas, with strong senses of tradition and family. I grew up understanding hard work and the need for community, and I believe this is how I learned to deal with some of the disappointments of life. For example, all four of my grandparents died within a span of three years – 2003 to 2005 – and in each case, the outpouring of love in the community was, to me, a reflection of God’s love. Growing up, I approached involvement in the Church as something I had to do to keep my parents off my back. I was much more into sports and hanging out with friends. Unfortunately, I carried this attitude throughout high school and college. Once at college, I quit going to Mass except for times when my parents would visit. After college, I moved down to Oklahoma City and continued my lethargic faith life, going to Mass once or twice a month. I felt guilty about it, but I never really saw any advantages to being involved with a church except to meet people – and I felt satisfied with my social life. Then, in my mid-twenties, a good friend came to visit me for the weekend. I assumed we would do the usual party routine and get reacquainted, but he startled me with his new dedication to serving God and doing His will. We spent the next couple of days talking about heaven, hell and God. He had recently left the Church and believed he had found a worship community that was authentically searching for God and living the Christian life. I dismissed all this as just a buddy who was trying to find himself and being a little radical about it, but I started to reevaluate myself and what I really stood for. This led to my seeking God in different churches. I began attending a “megachurch” and having something of a personal prayer life, which, I soon realized, I had never had before. After a few months of this style of worship, I found myself desiring the Eucharist. I had never before had any real convictions about the Eucharist being the actual body and blood of Christ; I just thought of it as something a little different that Catholics did. But I began to wonder: what am I really being fed at this church? A preacher, teaching from the Bible, can be helpful, but why should I listen to him? I began to wonder about the objective nature of my situation. Had I really understood Church teachings, or had I left because I wanted something that centered on my own feelings and perceptions? I began to go to Mass again, and I remember asking God to take over my life and guide me to do His will. This led to more periods of silence and prayer, and the feeling that I was called to the priesthood. I spoke with a priest who directed me to the RCIA program as a reintroduction to the faith. Bible studies and learning more about the Church strengthened my call. I began to pray the Rosary, and felt a sense of joy that almost seemed unreal. 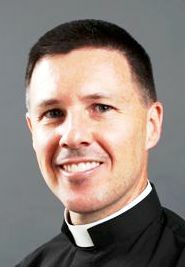 I have been in the seminary for four years now, and feel tremendously blessed and undeserving to have an opportunity to serve God’s people as a priest. I pray on Saturday mornings on occasion in front of abortion clinics; I also assist with RCIA and a “Light of the world” retreat group. I look forward to the Rome Experience as a chance to see how the Church responds from the home base of Rome to shifts in moral, political and social ideology and thought. God prepared me for priesthood through many people in my life. My parents’ examples of faith and devotion inspired me to follow God; my father was a convert and prayed every night, and my taught me my prayers and demonstrated a great trust in God. Through my parents and sisters, I have also come to appreciate the sacrifices people make for each other. In Vietnam, I was active in the parish youth group, served at the altar and felt drawn to the priests’ way of life. 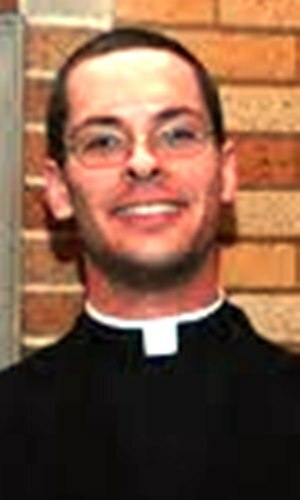 At twelve, I experienced a vocation to the priesthood for the first time. Leaving Vietnam and my parish, and coming to the US at age 17, landed me in a new culture with many values totally opposed to those of my own, which raised many questions in me about my faith and my future. A gift for studying math and science helped me see that the materials on which science performed its investigations proved God’s existence; there must be a Person who caused everything to happen, and that Person was God. After obtaining a master’s degree in applied physics, I entered St. Patrick’s seminary at 25. Study has always been important to my vocation and its growth; this is part of my desire to participate in The Rome Experience. I hope the program helps me learn to reach out not only by way of my intellect but through appreciation of others’ artistic creativity.